1. The potential cubic contents of a cavity or receptacle. /ca·pac·i·ty/ (kah-pas´ĭ-te) the power to hold, retain, or contain, or the ability to absorb; usually expressed numerically as the measure of such ability. forced vital capacity (FVC) vital capacity measured when the patient is exhaling with maximal speed and effort. functional residual capacity the amount of air remaining at the end of normal quiet respiration. heat capacity the amount of heat required to raise the temperature of a specific quantity of a substance by one degree Celsius. 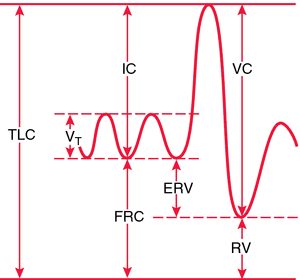 Symbol C.
Subdivisions of total lung capacity: TLC, total lung capacity; VT, tidal volume; IC, inspiratory capacity; FRC, functional residual capacity; ERV, expiratory reserve volume; VC, vital capacity; RV, residual volume. 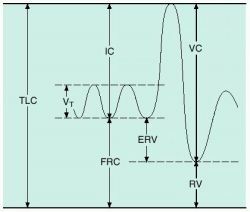 vital capacity VC; the volume of gas that can be expelled from the lungs from a position of full inspiration, with no limit to duration of inspiration; equal to inspiratory capacity plus expiratory reserve volume. 1 the power or ability to hold, retain, or contain, or the ability to absorb. 2 mental ability to receive, accomplish, endure, or understand. See also capacitance. 3 the volume or potential volume of material (solid, liquid, or gas) that can be held or contained. A generic term for the sum of the resources available to an organisation, service or community, including people, money, equipment, expertise, skills and information. A term referring to a person’s ability to understand and retain information about his/her medical condition and need for treatment. Patient rights The capability of a person to function as an autonomous unit. See Testamentary capacity. 2. Ability to do something mental or physical. the ability to store an electric charge, measured in farads (Fd). n legal qualification, competency, power, or fitness. n (normal capacity), the volume of gas in the lungs at resting expiratory level. n a measure of the binding capacity of iron in the serum; helps to differentiate the causes of hypoferremia. This capacity tends to increase in iron deficiency and diminishes in chronic diseases and during infection. n the volume of air in the lungs at the end of maximal inspiration. n the maximum volume of air that can be expired after maximal inspiration.